← Determine the number of pages in TIFF, PDF, JPEG, PCL, PS, PRN, XPS, PXL, etc. spool documents. Determine Color Depth (color, black/white, grey scale) and DPI for Each Page. PDF is a hugely popular format, and for good reason: with a PDF, you can be virtually assured that a document will display and print exactly the same way on different computers. However, PDF documents suffer from a drawback in that they are usually missing information specifying which content constitutes paragraphs, tables, figures, header/footer info etc. This lack of "logical structure" information makes it difficult to edit files or to view documents on small screens, or to extract meaningful data from a PDF. In a sense, the content becomes "trapped". 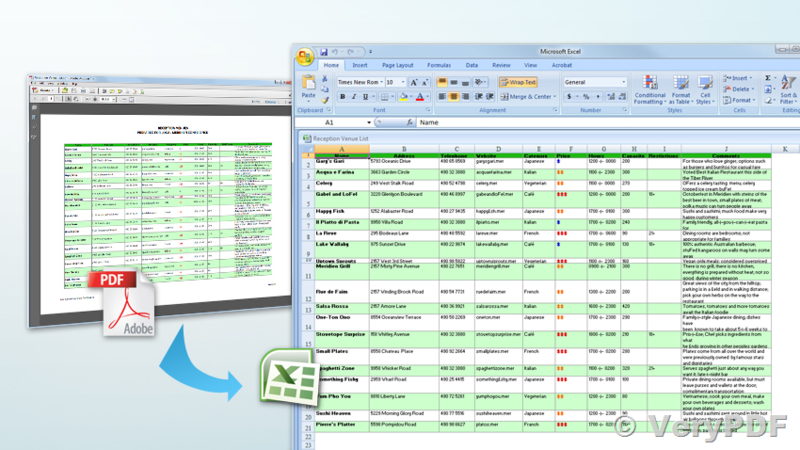 VeryPDF PDF to Excel Converter is a simple to use command-line tool that can be used to recover tables, text, and reading order from existing PDF. VeryPDF OCR to Any Converter Command Line is a professional OCR software to convert scanned TIFF, PDF, JPG, PNG, etc. document formats to plain DOC, RTF, Excel, CSV, HTML, XML and Text formats, it does recognize tables automatically during conversion. The PDF Table Recognition Technology in PDF to Excel Converter and VeryPDF OCR to Any Converter Command Line is a great technology to recover tables from text based and scanned documents automatically, if you are need specific customizations or more options, please let us know. How to OCR PowerPoint Presentation? How to OCR PPT and PPTX documents? This entry was posted in OCR Products, PDF to Excel Converter, PDF to Excel OCR Converter and tagged PDF to Excel, pdf to html, pdf to table, pdf to tabular, pdf to text, pdf to xml, tif to excel, tif to html, tif to table. Bookmark the permalink.